ALTHOUGH JUSTIN does not mention hymns in his account, other sources provide ample reason to assume their presence at this time. In the ancient world, the normal way to praise a deity was through melodic words or chant. Hymns, therefore, may have been present under Justin’s descriptions of Scripture reading or prayer. 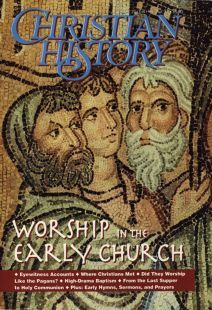 In favor of including hymns with Justin’s mention of Scripture reading would be the later practice of interspersing psalms among the different Scripture readings—and the fact that most of early Christian singing was of the psalms or psalm-like compositions. In favor of subsuming hymns under prayer would be the consideration that they had in common the elements of praise and address to God. The prayers of the synagogue (and the synagogue service was a model for early Christian worship) were recited in a chant, and Christians may have followed this practice. So the distinction we make between prayer (prose) and hymn (poetry or song) would not have been evident in Justin’s time. Dr. Everett Ferguson is professor of Bible at Abilene Christian University and editor of Encyclopedia of Early Christianity (Gardland, 1990).